Perth’s historic Grubb Telescope was ordered in 1896 and installed in 1900 at the original Perth Observatory site on Mount Eliza in Western Australia. Over more than 8 decades, this historic instrument produced thousands of photographs on glass slides, covering a wide swath of the southern skies for the Astrographic and Carte du Ciel catalogues. In the 1960s, when the Observatory was relocated to Bickley, the Astrograph was disassembled, then reassembled on its original mount under its original dome at the new site. Unfortunately most of the original Astrographs are now destroyed, discarded or lost. The Perth Astrograph is the only Grubb Astrograph still intact with its original optical tubes, mount and dome, but it is in desperate need of restoration, with flaking paint, some rust, and mechanical components in need of repair. 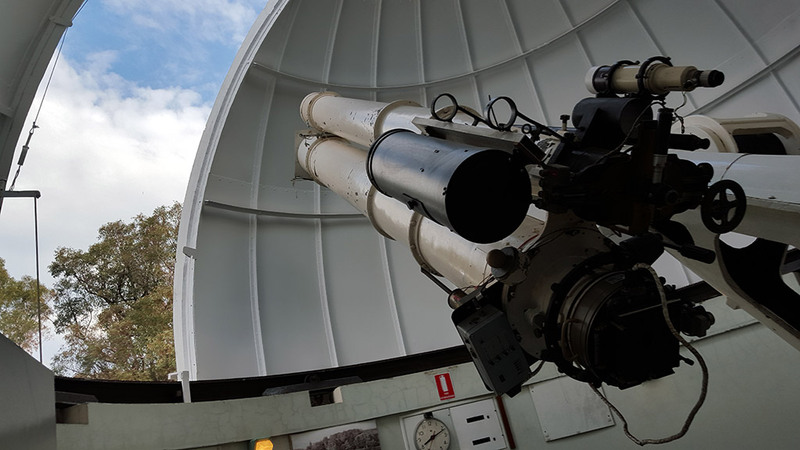 To save the telescope from further deterioration, the Perth Observatory Volunteer Group (POVG) has embarked on a project to completely refurbish the instrument. We have already consulted with other sites who have restored similar instruments, and held discussions with conservators, subcontractors, and state authorities. Now we are ready to remove and clean the telescope’s parts and fittings, carefully remove existing paint from the telescope and mount, and treat corrosion. The type of paint and fragility of the telescope, means time-consuming manual methods are needed to prepare the surfaces for repainting. The project is being sponsored by Perth based company Saferight, a leading provider and manufacturer of safety training and equipment, who have donated the use of scaffolding equipment for the duration of the project so our volunteers can safely access the telescope. POVG volunteers will spend hundreds of hours, but they need help to purchase materials such as chemicals, scrapers, paint, brushes, personal protective equipment costing up to $5000. Perth Observatory is listed on the deductible gift recipient registry, so all donations are tax-deductible, and a tax receipt will be provided. We are grateful for donations of any amount made via direct bank transfer (EFT) or using the form below.